Microsoft is aiding new features to the Windows 7 taskbar. One of the features is the ability to move taskbar items around on the taskbar easily. Not every user might find it useful to move taskbar items but it could be appreciated by users who want to make sure that certain programs and folders appear in the same location all the time. Taskix is just one program for the Windows operating system that allows users to move Windows taskbar items around. A new version of the software program has been released as a beta recently adding support for 32-bit and 64-bit editions of Windows XP, Windows Vista and Windows Server 2003 and 2008. By default only the function to move items in the taskbar is activated. This is simply done by left-clicking on a tab in the Windows taskbar, holding the mouse button down and moving it to another location. The cursor changes as soon as the user begins to move the mouse after selecting an item in the taskbar. Taskix supports multi-monitor systems and can start with the Windows operating system. Both of these features are optional. As are the following features which can be enabled in the program's options. The first option makes it possible to scroll through each tab with the mouse wheel so that each window - with the option exception of minimized windows - becomes the active window on the system. 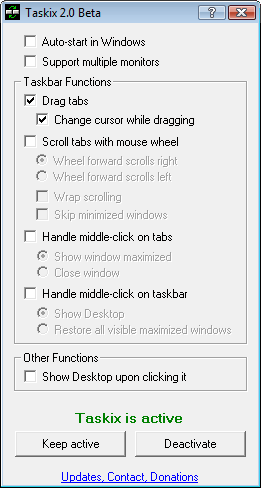 Middle-clicks on the taskbar can be configured to either show the desktop or restore all visible maximized windows. The middle-clicks on tabs on the other hand can either maximize that window or close that window immediately. Taskix is a lightweight software program. It runs in the background and consumes about 1 Megabyte of computer memory. i used this back in my XP days. highly recommended, i think it’s the best app of this type. tiny, portable, barely there, and very useful. Taskix is an excellent program. It works with XP and Vista. It is even compatible with UltraMon so you don’t lose it’s funtionality on multiple monitors. I contacted the author to see if he will be making Taskix compatible with Windows Vista 7. He said that he has no plans to do so. I switched to Vista 7 and am now using 7 Taskbar Tweaker instead of Taskix. The only problem is that it’s not compatible with UltraMon.